Apache IvyDE maintains a global configuration, which controls the behaviour of every Ivy instance in every project in the workspace. This global configuration can be overrided in each project. 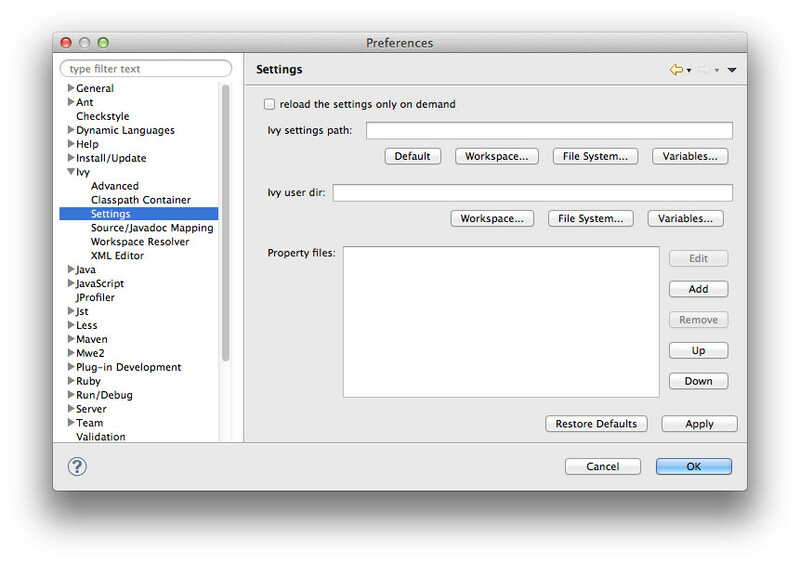 The global configuration can be found in the preferences of Eclipse (menu Window > Preferences for Windows and Linux users, Eclipse > Preferences for mac users), and select the item Ivy. If checked, the Ivy console will be opened on startup so that every log from Ivy will be printed. This is especially usefull when looking for debug log from IvyDE starting up. Specifies what Apache IvyDE should do in every project containing an IvyDE managed classpath container when Eclipse is starting up. 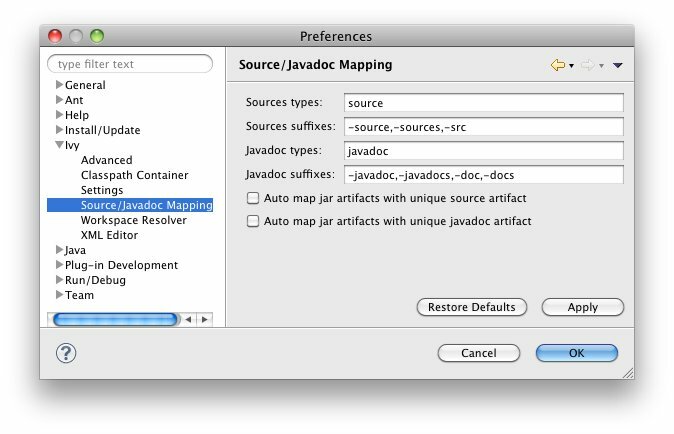 Controls whether a resolve is performed each time Eclipse detects a change on an ivy.xml file configured by an IvyDE container via a save in the editor, a refresh, or a team/update. Your company name for Ivy editor completion. Your company web site url for Ivy editor completion. 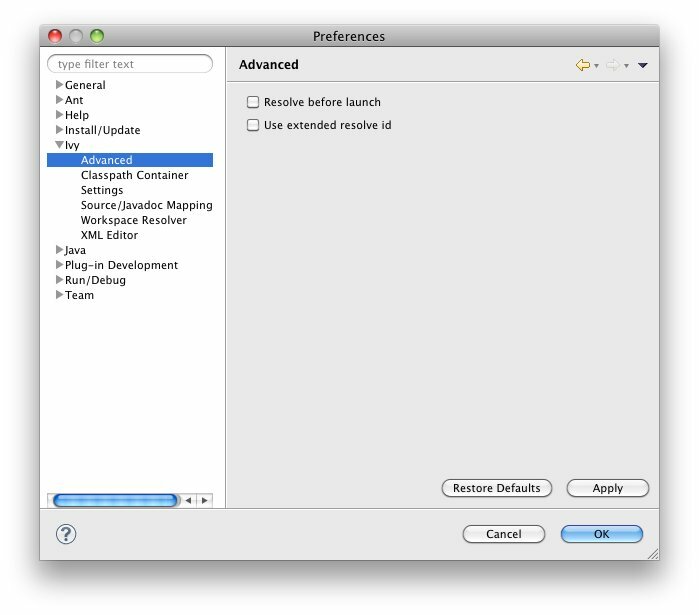 An IvyDE container can be used in the classpath of a launch configuration, and the container can be resolved on each launch. See the documentation about launch configurations for further information on this feature. A resolve id is an identifier which helps Ivy to make cache of results of resolve. By default IvyDE each the id which is composed of the organisation and the module name. An extended resolve id is also composed of the status, branch and revision. If you have troubles with the resolve of multiple versions of the same project within the same workspace, you should probably enable this option. Apache IvyDE allows Ivy dependencies between projects in the workspace to be realized through project references rather than jars from the repository. See the documentation for further information on this feature. If your classpath is based on jars which are actually OSGi bundles, checking this option will make IvyDE read the jar manifests and setup the specific OSGi visibility constraints. A comma separated list of extensions which will make IvyDE add the artifact to the classpath. Setting * will make very kind of type accepted. Note that a type specified as a source or javadoc type won't be accepted in any manner. 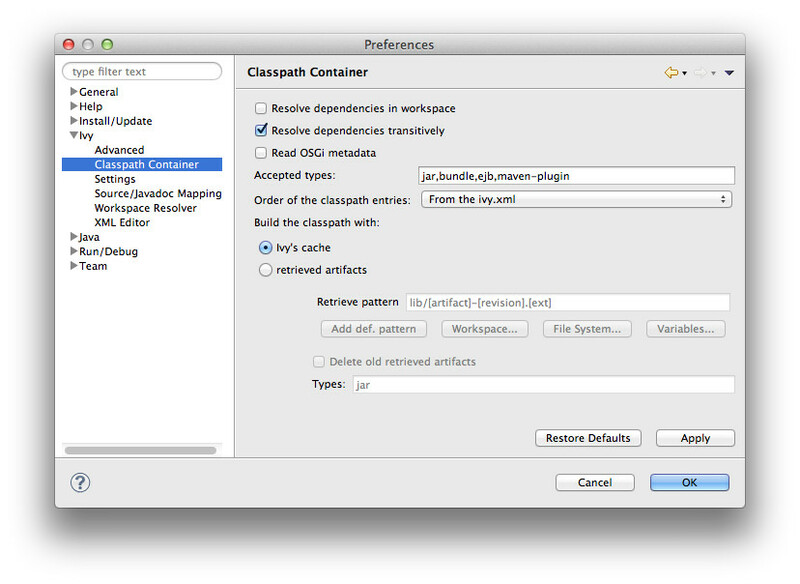 By default, the classpath container entries are ordered by order of declaration in the ivy.xml. When there are many entries, it can be useful to have them ordered lexically for enhanced readability. Either Ivy with build a classpath with references to the artifacts in its cache. Or Ivy will retrieve the artifacts with the specified pattern, and then build a classpath with the retrieved jars. Retrieve pattern: The pattern to use for the retrieve. Check Ivy documentation for pattern explanation. Delete old retrieve artifacts: On each retrieve, the previously retrieved libraries will be removed (similar to the sync argument in the Ant task). By default, Apache IvyDE will parse the ivy settings file each times it is needed (each resolve, refresh, clean cache or completion in the ivy editor). For remote ivysettings this can slow the UI dramatically, so it is possible to make IvyDE keep the settings in a cache and only reload them via the context menu on the container). The path to your ivy settings file. Leave it blank to use Ivy default resolvers. See also the documentation about Eclipse variables. A comma separated list of Ivy "type" names which should be considered sources. A comma separated list of suffixes which will make IvyDE attach as source the artifact with the suffix to the artifact without the suffix. For instance, "commons-lang-sources.jar" will be attached as source to "commons-lang.jar" with the default value. For further information on how the mapping works, checkout this specific documentation. 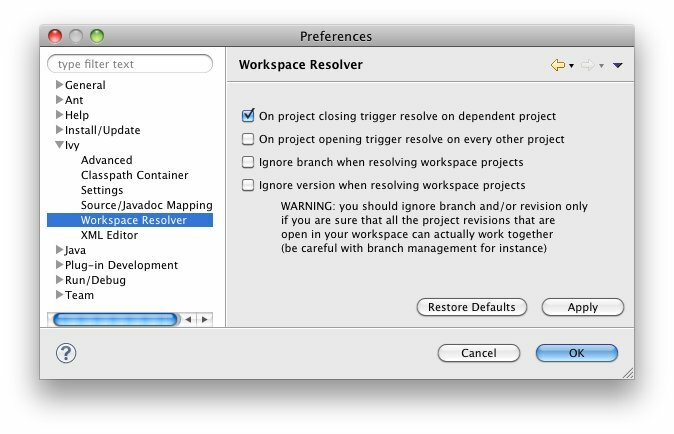 Closing a project which has the workspace resolver enabled will trigger a resolve on every project that depends on it. When a project is opened, IvyDE will trigger the resolve of every other project which has the workspace resolver enabled. 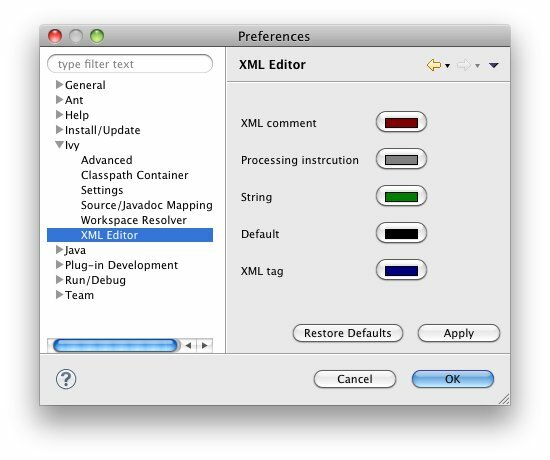 This option forces the workspace resolver to ignore the version of a module specified in an ivy.xml if a project containing an Ivy file with that module organization and name is found in the workspace, instead substituting a project reference. This may have unintended consequences. For further information on how the workspace resolver works, checkout this specific documentation. This configuration panel allow you to change the color used in the Ivy file editor and the Ivy settings editor.